If you are a PRO+ account holder, you can now set up sub accounts and manage all of your engineers. These are known as Sub Users, and you will be known as the parent/master user. Having Sub users makes the masters account holders account more private and secure. You wouldn’t want your staff members to be looking at your customer database or your invoice information hence why we created sub users. 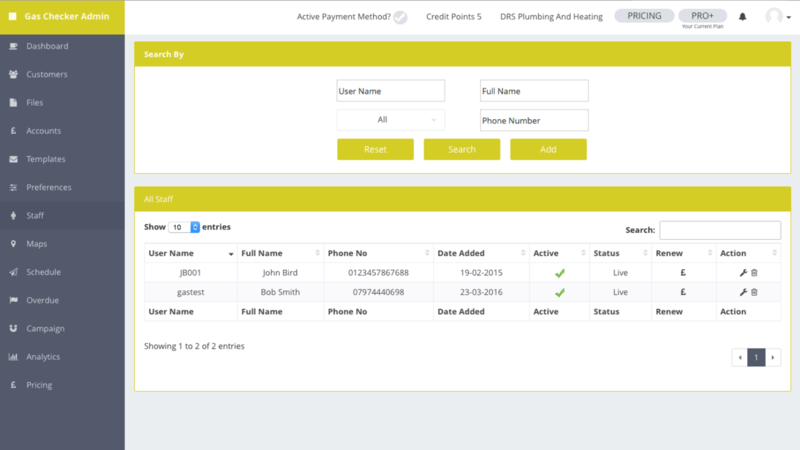 The master account holder will need to create the sub users profile using the Staff Manager on the Gas Checker Dashboard. To do this, you login online and select ‘add staff’. This can then be repeated for each staff member. When the sub user logs in, his details are set and he is unable to change them, this is to stop fraudulent activity taking place by a staff member. As you set the account up, you are able to change any details needed. A sub user is unable to log into the master account and all sub user certificates will sync to the master account holders online account, this is to stop any sensitive information being taken and viewed by staff members. Activate that account by processing to checkout. Sub users priced from £2.50 + VAT per month, or £25.00 + VAT per year. Give the login to your staff member, ask them to login to the app ensuring they tick the “i am a sub user’ box. They will then need to go into the Gas Checker app settings and sign their name and set up the auto sync and press save. They are now able to start creating Gas Certificates. As they have set up the auto sync, all reports/invoices created will be sent to the master account holders online cloud each day. Should a staff member leave you can delete the sub user or edit the sub users details so they can no longer log into the app.